Sarah Brenes, attorney. Photograph by Kelechi Uchegbu. Okafor discussed being a target. The current administration is “looking for attorneys who are breaking the rules. They’re calling us ‘dirty attorneys’ who are helping people do bad things,” Okafor said, referring to Attorney General Jeff Sessions’ Oct. 12, 2017 remarks to the Executive Office for Immigration Review. An immigrant herself, Okafor noted the complicated dynamic of being an immigration attorney. “Those of us who weren’t born here are at a high risk,” for being targeted by those who are anti-immigration, inside or outside the government, she said. After working in the profession for over a decade, the emotional toll of the job became too much to bear, and she left immigration law to take a government job. For immigration attorney Anna Alizadeh, these changes are most apparent in the number of appeals that are made by government attorneys. “I think that’s like their new policy is appeal everything,” she said. She and other immigration lawyers serve as defenders in these cases, representing their clients seeking asylum or refuge or simply a home in the United States. The prosecutors in immigration court are lawyers representing the federal government. Clients waiting for an appeal “have to be in custody,” Alizadeh said. “Unless they get bond.” Alizadeh also noted that the way in which judges grant bonds has changed, saying that if her clients are granted a bond, it typically is between $5,000 and $10,000, rather than the $1,500 to $3,000 range it was four years ago. She pointed out that two of the five judges at the Bloomington, MN immigration court previously served as attorneys for the government. “The system really feels it’s anti-immigration,” she said. “The judge is supposed to be partial, unbiased, objective.” Of course, humans can never be objective, as much as we might try. The role a judge had before putting on their robe influences the ways in which they perceive cases, and make decisions about them. Another change Okafor pointed out is the ways in which people are being held. “The people who are being largely kept in what are – in every other way – criminal holdings, are overwhelmingly people who have never committed a crime,” she said, noting that immigration violations are a civil – not criminal – offense. “But the types of technology used, the types of weaponry used, the types of clothing used, the way in which people are,” do not reflect this status. Brenes spoke more to the changes she’s noticed in the climate of Minnesota. “I think there certainly is a heightened climate of fear and feeling unwelcome,” she said. All three women shared sentiments of being overwhelmed by the vastness and brokenness of the US immigration system. Brenes’ organization, The Advocates for Human Rights, has multiple branches to help address this. In addition to their direct action of providing pro bono legal services to people who have been detained and are seeking asylum, they have, as Brenes says, “a broader mission to explore and help uphold international human rights law.” Lately, the Advocates have focused on integrating the different aspects of their work. One way the Advocates work to remove barriers for asylum seekers is by submitting reports to the United Nations about human rights conditions and violations. They invite their clients to share their stories anonymously to contribute to these reports in hopes that the reports will then spur action to stop the atrocities people are fleeing from. Brenes does find hope in the way that she sees people showing up to help. Brenes says these lawyers frequently are not immigration attorneys, but are driven to help and receive training and support to capably represent their clients. “I think one of the silver linings of the anti-immigrant administration is that people want to come out in droves to help,” she said, referring to Minnesota’s strong pro bono culture. Alizadeh confirmed this, saying that although she works only as an immigration attorney, she does much of her work pro bono. “I had to meet with this woman whose brother was detained,” she remembered. “She had five kids with her, three of them were his kids, two of them were her kids, and she didn’t have money to feed the children. So how could I charge them?” Alizadeh asked. She believes that good deeds have a way of circling back to you, and so far in her practice that’s proven to be true in that she’s able to sustain herself. Though attorneys who volunteer at the Advocates are not immigration specialists, the value of having an attorney is immeasurable. “I think of the reality of just how many people are detained and how many go unrepresented is pretty overwhelming and unfortunate,” said Brenes. In an effort to provide legal counsel for more people, in August Hennepin County finalized a $275,000 contract with three legal organizations to provide representation for residents in deportation hearings. 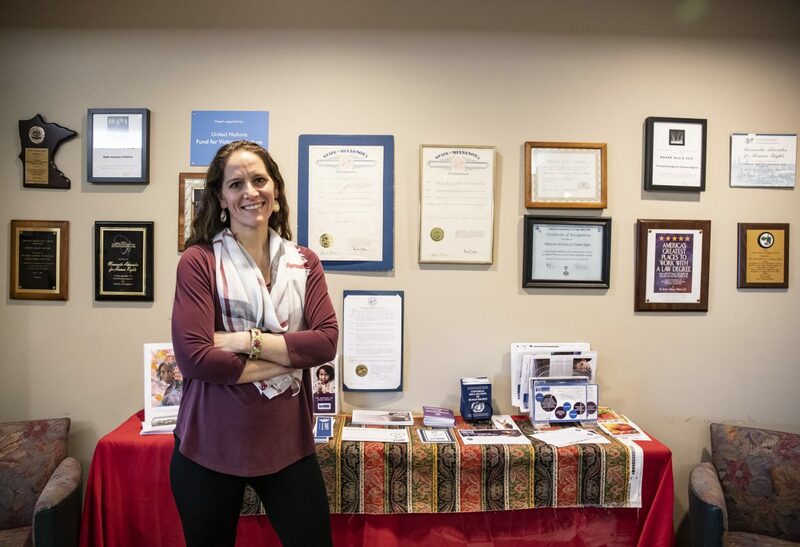 A consideration Brenes must keep in mind for her volunteer attorneys is that because many of them come from other fields of law, they are frequently unprepared for the amount of emotional impact of working with people fleeing trauma. To help address this, in addition to providing trainings, the Advocates pair their volunteers with mentors. “It’s oftentimes very difficult to train on a lot of the issues that people face in the abstract,” Brenes said, “but it’s after they have that meeting with the client and they’re not sure where to go, how to help them in the best way or how to process it themselves” that the mentors step in. Like Okafor, Alizadeh is also an immigrant herself. She was born in Iran, and spoke about a case where she was defending a Kurdish man. “It was really a lot more than I wanted to get involved with,” she said, alluding to the huge emotional impact the case had on her. “I will say it’s a very discouraging time, and it makes you question if there’s more bad than good in the world,” said Alizadeh. Corrections: A previous version of this article attributed “People are feeling fearful no matter how long they’ve lived here, so long as they’re not born here in the United States,” to Okafor, but it should have been Brenes. The following quote had defendants instead of defenders, “She and other immigration lawyers serve as defenders in these cases, representing their clients seeking asylum or refuge or simply a home in the United States.” Lastly, it was stated that there are three immigration judges in Bloomington but there are five. [UPDATE Feb. 3, 8:11 p.m.] A federal judge in Seattle has halted the ban by granting a temporary restraining order on the grounds that the ban targets Muslim immigrants, in violation of their First Amendment rights.